One of the smallest countries in South America, tourist-friendly Uruguay is often called the "Switzerland of South America" because of its consistent economic development and progressive society. 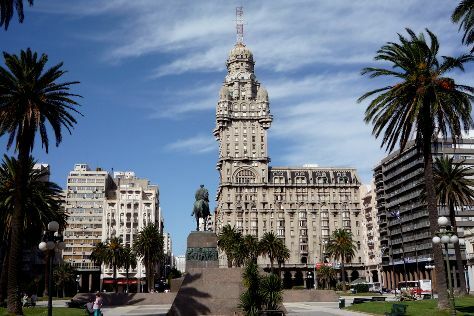 Open-minded Montevideo serves as the starting point of most Uruguay vacations, offering visitors an eclectic cultural scene and a chance to discover some of South America's major architectural treasures. Away from the cosmopolitan capital city, vacations in Uruguay involve exploring wildlife-rich areas along the Atlantic and touring the rustic interior on horseback, gaucho style. In this sports-loving country, the highlight of your Uruguay trip might just be a soccer match between Penarol and Nacional, the country's two major clubs. Uruguay is in South America. Take stress off the schedule by using our Uruguay trip planner.